Trade Rumors: How Will the Knicks Mess This Up? 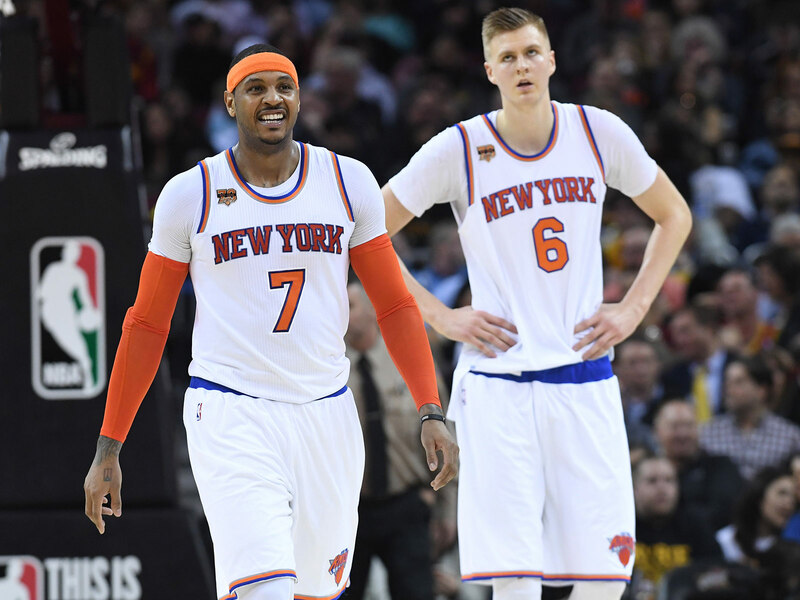 Should the Knicks build around Kristaps Porzingis? Should they trade for Kyrie Irving? The Crossover's Madelyn Burke, Rohan Nadkarni and DeAntae Prince debate the best move for New York. Give the Knicks credit for this—they always keep things interesting. It's the middle of August, yet New York finds itself immersed in potentially franchise-altering trade rumors. Carmelo Anthony's name continues to be a mainstay of the rumor will, with the Knicks star reportedly eyeing a move to Houston. In addition, the Knicks have been one of the main teams mentioned in Kyrie Irving trade talks, with Kristaps Porzingis being mentioned as a potential Cavaliers target. The Crossover's Madelyn Burke, Rohan Nadkarni and DeAntae Prince recently sat down and debated what the Knicks should do next. Madelyn Burke: The Knicks have limited assets yet seem to be in on the conversation in two trades. What moves will make the most sense for the long-term benefit of the franchise? Nadkarni: … [laughs] it looked like it became an ego contest between him and Phil Jackson, and Melo won. He outlasted Phil and that’s great, I’m happy for him. At the same time I think he’s realized it’s time to move on, obviously he’s trying to make his way to Houston, but if you look at the Knicks right now they have some good pieces. They’ve got [Wily] Hernangomez, they’ve got [Kristaps] Porzingis, they’ve got [Frank] Ntilikina, all guys you can build a core around, build a team around. Then you still have Melo, [Joakim] Noah, you signed Tim Hardaway this offseason, you’ve got to find a way to move these vets, get rid of these vets. I think if they’re really looking toward the future, it starts with moving Melo. DeAntae Prince: Yeah, moving Melo is definitely important, but I’d say because Kyrie is such a better basketball player at this point, that anything involves him is more important than whatever involves Melo, and his hoodies, and his late-night run at Chelsea Piers. Burke: If Hoodie Melo was playing this would be a different conversation, but there’s no hoods in the NBA. Even in the Nike uniforms, we tried, but Nike didn’t include the hoods. But here’s a question too: If Kyrie gets moved to New York and Melo stays, does that make it more enticing for Melo and Kyrie to team up there? Prince: I think that’s the worst-case scenario. For the Cavs, if you look at it from Cleveland’s standpoint, it’s super important in the NBA as a whole. They’re the only team competing with the Warriors. So if you bring Kyrie to New York they instantly become a playoff team in the East because the [conference] is so far down. And I’m not sure that’s necessarily what they’re looking for right now. You talked about all the issues they have—they’re still building a team. That probably works in the opposite direction of what they want. Nadkarni: Yeah, I don’t like the Kyrie fit in New York. Maybe you can dump some contracts in a move like that. But first of all you just drafted a point guard in the lottery. I’m not saying Ntilikina is as good as Kyrie right now, but maybe at least give him a chance to maybe see what kind of player he becomes. Beyond that, his fit with Porzingis, Irving said on the record he wants to be the guy leading a team. You have that person and you have that alpha personality right now in Porzingis, now you’re going to bring in another guy who stunts his development? Beyond that, if you’re forced to trade Porzingis, for Kyrie, that to me is the worst-case scenario. So I don’t think they’ll do that, but you know I just think there’s a lot of issues there. I think Kyrie is a good, if not great player, but I just don’t like the fit for him in New York. Kyrie is in a position where he’s not going to win a championship the next season or this season when he gets traded, but he’s closer to win-now than the Knicks are. So I just don’t really liking the timing on this move right now. Burke: With that landscape in the East, I don’t think the Knicks are going to be in a title window for at least five years, but there’s a lot of options on the table right now for this franchise. How impactful though is what they do now for the legacy or job security for the new president Steve Mills and the GM Scott Perry? Nadkarni: Well, we saw James Dolan had a lot of patience with Phil Jackson. He’s kind of taken a step back from the basketball operations side of this whole thing. I think he’s going to have patience and give the guys a chance. Steve Mills is kind of the cockroach of the Knicks’ nuclear war. He’s just outlasted everything. I don’t know what kind of dirt he has on Dolan, but he’s lasted a long time. I don’t think the Knicks have to make a splashy move right now—the best thing they could do is to not do anything. Keep Porzingis, don’t make any crazy movements. They already made this [Tim] Hardaway signing, which is just insane. They already need to find a way to get out from under that one. Burke: Between Hardaway and Noah, they are so anchored down in commitments. Prince; Yeah, the Knicks have a lot of fires to put out in a lot of other places. So I think they’ll be fine with staying pat for a little awhile and trying to let this team build from the ground up because they’re definitely on the ground floor right now.